In this edition of my blog series feature Behind the Art, meet Renata Ravina—the fire behind the Red Rocker. As Sammy Hagar’s business manager, she’s kept him busy and in high spirits. Starting as a fan of Sammy’s (her first concert was a Sammy show! ), Renata soon worked her way to the ultimate job. 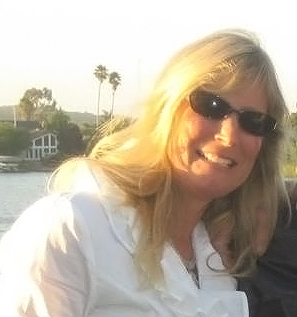 Business Manager for Sammy Hagar. 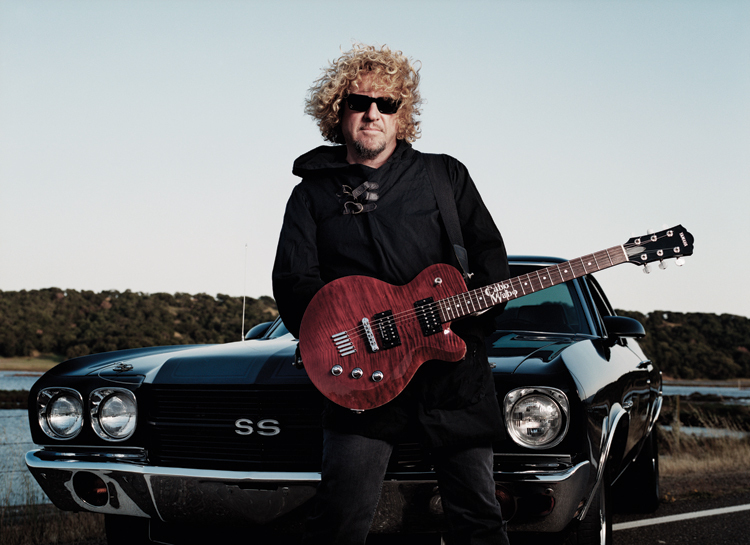 Follow Sammy Hagar online. My girlfriend called me and said Sammy Hagar’s business manager was looking for an assistant (May 1987). I interviewed and was hired immediately. The business manager left and other people came in, but I remained and the job was mine. Sammy is the only artist on your roster. Who’s the first artist that got you started? Sammy. I was hired by his business manager, Sarah, to be her assistant. She left a few years later. No doubt, you’ve achieved many successes in your career. 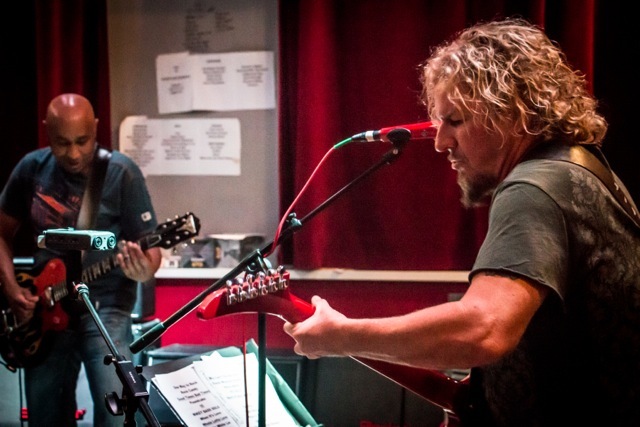 What’s your proudest moment in working with Sammy Hagar? Attending the induction of Van Halen into the Rock and Roll Hall of Fame on March 12, 2007. It was an extremely fun time at the Waldorf Astoria in NYC. 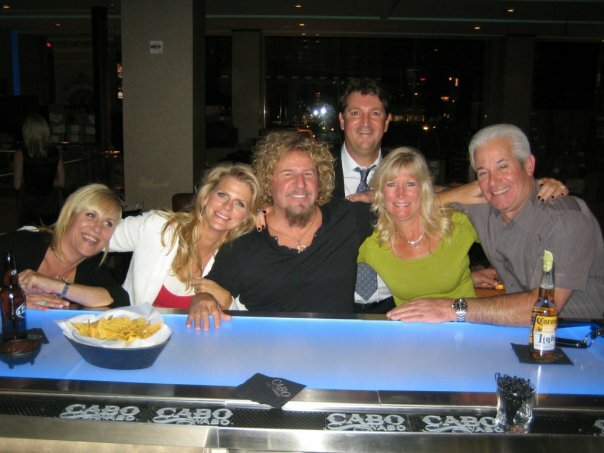 L-R: Janna Monroy, Kari Hagar, Sammy Hagar, Renata Ravina, her husband, Bill. Back row: Marco Monroy (Sam’s business partner). Getting introduced by Sammy at a Lake Tahoe outdoor show was really special. I danced and head-banged away! I’ve been behind the scenes for so many years that coming out is a lot of fun. Once at the Marching to Mars show in Stockton, I had no idea how to lead a bunch of onstage fans and messed up! It was hilarious! I live on the water in Bel Marin Keys because I love the view. I’m up, showered and dressed, and check my emails before 6:45a.m. . . . Take my dog for a 1-2 mile walk every morning—rain or shine—do a quick vacuuming of my house, and hit the office in my home. Getting stuff off my plate, which is constantly flowing. Checking items off the list. Is there anything unusual about your workspace? Adding machine, phone, desk light, laptop with docking station, large screen monitor, keyboard, tons and tons of files, corporate binders, endorsement stamps, calendars, laser printer, stapler, tape, paper clips, pens, and photos of my husband and boys. What’s the view from there? I have a view of the park next door. I start my cuckoo clock every morning and the ticking is the only sound while I work, aside from my busy phone, keyboard, and adding machine. I’m a clean freak. Imagine—John Lennon. I would like to see PEACE in the world. Lennon died on my birthday and I will never forget that. Born in the USA—Springsteen. It’s just powerful! Lights (When the Lights Go Down in the City)—Journey. Because I know that visual and have seen it many times living in the Bay Area! Wow, I enjoy a lot of James Patterson and couldn’t just pick one. Danielle Steel—I’ve read all of them. The Notebook—Nicholas Sparks. My favorite. I read romance and mysteries to take my mind away from all the business and legal documents. I’m very much into routines and if I don’t stick to it, I think something will happen. Do you have a funny story related to your job, perhaps at a Sammy show? I was in Cabo with my husband and his brother, and they were at the pool at one of the hotels, and a fan was telling them about this person Renata and how they would send Renata stuff for Sammy. The fan had no idea they were talking to my husband. They said, “We know Renata.” And my husband said, “She is my wife.” I came down to the pool, and my husband introduced me to them. It was hilarious. In my business life, I am very tough, and I treat Sam’s money like it is my own; but in my personal life, I am very sensitive—a total softy—and give in. I’m very detailed and precise . . . must be the Swiss blood in me. People who pursue something they are passionate about will rise above and succeed. If you love music don’t stop playing and trying, as long as you find pleasure doing it. Go for it! There are so many sides to the music business, and I’m sure you will find an area that keeps you fresh and wanting to keep evolving. Pure coincidence that one of my first concerts was Sammy Hagar at the Marin Civic Center. I made a batik in high school of one of the shirts from the show. I have always been a fan—long before I ever worked for Sammy. He is Uncle Sammy to my boys, and he came to the hospital when my first son was born. I plow forward and have seen so much over the years. I take tremendous pride knowing that I have helped Sammy be the successful human that he is.